Work for Fonteva for Associations? "Out of the Box Customer/Membership Management Works Fantastically"
As a developer / technical consultant, when a customer is mentioning use cases involving "customer engagement" or "organize our member base" the first product that comes to mind is Fonteva Membership application (now called Fonteva for Associations?) This product easily saves me months of development for a product that I couldn't even compete with. Just like you don't want to build your own cloud based CRM product, why build your own customer engagement Salesforce functionality, when someone already did it cheaper, better, less buggy, and with a technical support team. Choosing Fonteva's software is often a no-brainer for my team and my customers. Custom development on top of the Fonteva platform can add unnecessary complexity to the application. Can add more dev time to the project since you are building on top of other's codes, but in the long run the time you save is usually far more. "I want an easy system in Salesforce to engage with my customers"
"I want to drive customer engagement and have my existing base purchase/do more with my product"
"Great AMS for Diverse Needs of Nonprofit Staff"
Fonteva is a flexible AMS where the end users can customize the product to best serve their business needs. We had a few issues with implementation but we have resolved most now (18 months in). I do not like some of the membership functionality for managing individual membership terms and subscriptions. However, we have found work-arounds for our issues to use this system that best serves our overall association. It's a great product but it is imperative that you take the time to set it up correctly for your business operations. We rushed through the implementation and were not satisfied with the product at go-live. It has taken almost 18 months and a lot of angry customers to get us where we should have been in the beginning. We are using Fonteva to manage 100k association members, donors, and corporate partners. We will soon transition in events. The largest benefit is having all parts of our association under one system instead of multiple systems. "Manage your events and membership organizations easily with Fonteva for Associations." It helps the tracking and manging of all member associations from a single platform hence make it easy to run any organization/membership association. There is free demo on how to use the software that is availed and provided by the vendor. Its affordable and fits in all organizations whether small,medium or large. So far i have experienced minimal cons while using the software except that poor internet connections impede on its working. The platform is affordable and works reliably in all organizations whether small, medium or even the big ones. It helps them manage all of their events and membership events and everything there proving to be the reliable platform. Fonteva for Associations has helped us manage our associations and events easily where we are able to organize and track the attendance and make them more effective. This has helped shape our organizations and annual general meetings and boost the attendance. This has boosted our portfolio and improved our perfomance. "Association management out of the box"
Extends salesforce in ways that make sense for membership and event management. Almost meets all of our needs without much development. Robust events builder and management. This is something which is absent from our current CRM. I'm not sure if we're going to use the events management but from an admin perspective it is mature enough to handle our attendance for our smaller events. Great training and support staff! Nothing to dislike. I do not have experience with other Salesforce implementations so I don't have comparisons. Consider admin training a must. It was very comprehensive. As someone who had very little Salesforce experience to begin with I now feel very comfortable with Fonteva setup. We are moving from an old, antiquated CRM with lots of customization to Fonteva. Because of all of our custom code it was difficult or impossible to upgrade. Fonteva handles the development here so we will not have to worry about it! "Great customizations options, not usable out of the box for our needs"
There are many robust capabilities on the horizon for us once our foundations within the database are strong. App integrations are much easier than with our previous database. Cloud basis means access is quick and easy from both the office, and a plane on the way to the conference. Intense customization has been required in order to tailor the AMS to our needs, many of which we weren’t expecting. lots of these customizations were built in UAT and didn’t transfer to production successfully, causing delays and hiccups in our go-live. Reporting in Salesforce is always a challenge with their object limitations. Be thorough and deliberate with your business users when evaluating nitty gritty needs to make sure that you’re not experiencing mismatch of expectations. Corporate members across the globe, including hundreds of thousands of employees and hundreds of subsidiary companies, can easily and effectively leverage membership benefits. Our organization can synchronize more centrally and communicate effectively within the AMS. Email marketing tracking is easy on the contact level. "Top Notch Association Management Software"
We conducted an in-depth search and review to evaluate and select an Association Management Software (AMS) for our medium sized Association. There are a variety of reasons as to why we selected Fonteva, but to summarize here are our main reasons for selecting this product. 1. User Experience - The SF Lightning and Fonteva user experience for our end users is clean, simple, and easy to learn. The flexibility it offers is clear and concise to staff and will make their day to day work much more efficient. The system is highly configurable. 2. Community Groups - For a chapter based association like ours there will be many benefits to having this feature enabled. Chapters will have a variety of accessible features that our current AMS doesn't easily offer. 3. Integration - We use a wide variety of other software to run our organization. 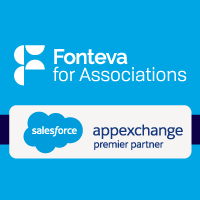 Salesforce and Fonteva's ability to connect with and integrate is simple and cost efficient. I highly recommend this a solution for your Association. Cost can be a barrier for smaller associations. All typical association tasks, membership, events, etc. MemberNation has solved so many of the problems that had plagued our organization for years. Issues with duplication, communication, and financial management were solved overnight in making the switch. There really isn't anything we don't like about MemberNation. The entire Fonteva staff did such a good job with the implementation that even our least tech-savvy staff members are using it. We thought for sure that at least half of our staff would not use MemberNation, simply because SalesForce was so different from what we were previously using, this was not that case. MemberNation is the cutting edge for association management. We did not think t we needed something as powerful as MemberNation, however, after taking a look at it, we knew that we had to go with it. The implementation has been a breeze and the folks at Fonteva are great to work with. We thought at first that we were jumping into the deep end by making this switch, but after only a short while we realized that this was a long-needed change. As I mentioned earlier, a big problem with duplicate contact records was solved by making the switch. We also have been able to tailor a great deal of email communication to our members with MemberNation, for the first time ever our database talks to our email server. "Fonteva's latest platform provides major enhancements for association management"
The most impressive thing about the MemberNation Platform is that it does an exceptional job of thinking through the business cases you'll encounter as an Association, and then streamlining those processes for you. Once you've completed the initial configuration working with the Fonteva team (special thanks in our case to Dagmar and Sundeep for their work) everything just works. There's a good amount of flexibility in terms of being able to customize and adapt a lot of features right out of the box, which makes our lives so much easier! They also have a great documentation center and training videos already created, which makes it easy for staff to get up to speed on the platform. There's really not much to dislike. The only thing that I'd recommend for folks, is to take advantage of the training they provide, and to make sure there is a member of your team truly taking responsibility for owning the project. As with anything, if there's no one from your team really invested in making sure the platform will be a success, it won't matter what software solution you use. You can evaluate a ton of member management platforms, but at the end of the day, I think Fonteva is doing an excellent job of making a robust platform, that continues to improve, and is really taking key member management issues into consideration as they develop their user-friendly platforms. There are several benefits for us in moving to Fonteva's product. From a member management perspective, we now have out of the box (and easy) auto renewal options, helping us to hopefully improve on what has historically been an aggressive churn rate on our membership base. It also has a ton of great features to help us enable our members to get access to our members only information easily, to manage their profiles, to purchase subscriptions and items in an easy store-like setup, and all in a platform that we can trust will work with our Salesforce setup without issue. The user experience - our members are delighted! Vastly improved from our previous database. Members can easily login, renew their memberships, register for events, and more! Built on Salesforce platform, which seems to be the CRM of the future - one that other companies are striving to interface with and develop to. We are confident that our investment will continue to pay off for a long time! The user experience with our previous CRM was pretty abysmal and the service provider was NOT willing to work with us to fix it - tried to charge an arm and a leg! It made much more sense for us to make this investment with Salesforce/MemberNation/Fonteva. We're so excited to share the new UI with members - and happy that Salesforce is constantly under development/improvement so we can continue to delight members for years to come! When shopping for an end to end solution, Member Nation has you covered. Built first as a robust accounting platform in your Salesforce instance, Fonteva then incorporates a vast majority of what is needed to operate most businesses through their variety of modules. I designed the Streams Ministries web site, which uses every module Fonteva offers, and I am pleased to say that the experience was a great one. I would encourage others to investigate how Fonteva’s Member Nation can benefit your organization. "Best AMS we've found after a lot of searching. Excellent growing team. Salesforce-based system." The training has been great, and we've learned a lot in a short period of time. The AMS is simpler to use than former systems. The features allowing us to manage members, eCommerce, and other elements are much more robust than we've experieced. There are some elements in terms of optimization which should be addressed. There are some objects which require switching back to Salesforce Classic, though most elements live inside of Lightning. We are striving to reduce the barriers to eCommerce for memebers to join or to purchase items. We are also striving for better UX for members to be able to access their benefits. Finally, we are seeking the easiest possible way to manage our members and non-member community. "Product meets our business needs with out of the box functionality"
MemberNation (MN) has proven to be an excellent AMS. The product is customizable, which allows Admins to configure the system based on their origination's needs. MN has allowed us to streamline processes that were once done manually. The Fonteva team worked diligently to help us reach our target go-live date. Our Business Analyst, Sundeep Pulaskar, was crucial to the project's success, as he used his expertise to understand our business processes and guide our internal team on configuring MN. Salesforce does have limitations on editing their managed packages which limits the Admin on certain configurations. However, we have found a work around solution for each of these limitations. Clean up data before uploading to MN. Draw out requirements before you begin the implementation. "Fonteva was the perfect AMS solution for our Association"
The best thing about Fonteva is their employees! They were truly team players through the whole development and Go Live Process. The software is awesome. With a SalesForce platform it is powerful and adaptable. We look forward to growing in our new AMS. A very smart decision when choosing Fonteva. We had some challenges with the integration between the AMS, LMS and CMS but that was not the fault of Fonteva. A very powerful software that is continually growing and offering new solutions. My organization transitioned to this system a few years ago and we are loving it. Fonteva makes our Annual Conference and summit events easy to navigate. The system is intuitive and user-friendly and I love how everything speaks to each other. Fonteva provides excellent step-by-step training and guides to make sure that users feel comfortable navigating the system. "Huge improvement over our previous system"
Setup took longer than expected but this was mainly due to issues with data cleanliness. Fonteva allows us to combine outdated systems into one unified place to access out member data. Customer service. They are responsive and work with you to find a solution that makes you and your members happy. We struggled to find a solution to our finance issues on the platform. But, again, they were very willing to work with us toward a solution. Talk with MemberNation users. Each association is unique and they can provide you with tips for implementing MemberNation. With MemberNation, we're able to gain better insights into our member engagement and trends, and provide a better user experience for them. We're also able to streamline the application process and automate many of our membership functions. "Fonteva best choice for small associations"
Flexibility and configurability are the two biggest reasons I love Fonteva’s system. Simplicity of set up and user- friendly interfaces are easy to learn and use right away. There isn’t much not to love about this system - it does just about anything a small association would need! "Excellent AMS alternative using SalesForce"
Ease of use. Tons of out of the box features and the ability to customize to meet business needs. So far I have not found anything that I cannot live with. Compared to other systems the nuances are easy to understand. Better front end user experience and better reporting using a cloudbased solution. "New to Fonteva and I like it!" Fonteva is build on the salesforce; therefore you get the same ease. In which Fonteva does a lot of the leg work. The Fonteva team has been really good to work with and the training has been very helpful in understanding what are the capabilities and limitations. When working on certain apps you have to switch to lighting and classic versions which can be confusing when you have to what version to get the task down. Different customization that our current database doesn't not allow us to do it. And also bring all data in one place. "System Review by Nikki B." Ease of use with certain functions, especially the Batching systems. I also like how easily customizable everything is - from reporting to events, etc. There have been certain bugs and kinks with text formatting and trying to print invoices. Make sure you have a solid process in place for implementation and have someone internally that is focused on knowing how everything works. Realizing that less is more and the system allows us to be more streamlined and efficient. MemberNation is exactly what our organization was looking for. Backed by the power of Salesforce, MemberNation allows us to customize our database to our specific needs. In addition, MemberNations beautiful, functional front-end pages give our members a easy and intuitive experience online. The software is a bit more expensive than other AMS software. While the price is a bit of a stretch for our organization, the number of features that come with MemberNation and the benefit of having a customized AMS solution built on the Salesforce platform outweighs the costs. With MemberNation, we're able to automate alot of our manual processes. Our front-end forms are now easier to use and more intuitive than with our previous database. "Member Nation--Great product; Great customer service." We are revamping our entire system and while we are still in the implementation stages, we are already loving it. Combined with the superb customer service, this product is a must-have! So far, we have no complaints with Member Nation or Fonteva. The staff is so knowledgeable and helpful, you can't go wrong. Totally upgrading our whole system...front and back end of an association's website/database. "Great user experience and platform"
MemberNation provides a great user experience and easy to navigate platform. It has helped solved our problems of having messy data and clunky application process. Some issues during launch but they were willing to assist the best they could. Having clean data and easy application process. That it is going to make my life easier by our members being able to register for programs themselves online. Once we are all trained and know what we're doing, everyone's lives are going to be made easier. This gives our members a lot of freedom to do things themselves. It's going to save us on supplies, phone calls, etc. "Step up from our experience with Personify"
Ease of use for our non-technical users. Ability to extend functionality as needed with Spark and the app Marketplace. Limitation to 3 objects for reporting, additional limitations with reporting. Slowness in running queries outside of MN/SF. This is our new AMS, looking forward to being able to share report information with our c-suite easier than using Crystal Reports. Everything from the UI to usability to features. Nothing. There may be some features that can be improved. Easy implementation process. Very flexible. Many payments processor options available. Cloud based and accessibility. Flexibility to create your own new fields and forms. Automation of various process. Clean easy to understand screens. "Great program for a great cause"
Learning about Fonteva for Associations? * We monitor all Fonteva for Associations reviews to prevent fraudulent reviews and keep review quality high. We do not post reviews by company employees or direct competitors. Validated reviews require the user to submit a screenshot of the product containing their user ID, in order to verify a user is an actual user of the product. Hi there! Are you looking to implement a solution like Fonteva?